Design Data's support department will be hosting a two-part webinar series in April on handrails in SDS/2. 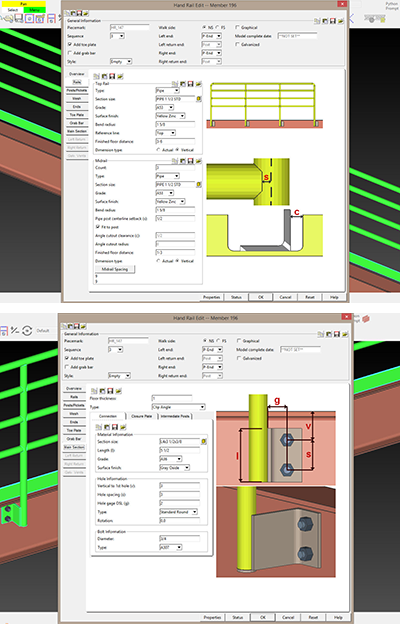 The flexibility and complexity of SDS/2's handrail member allows for many different handrail configurations to be modeled along with connections to beams and stairs. In Handrails, Part 1 - Inputting Handrails and Locating Posts and Rails, users will learn how to input handrails — both flat and sloped, and with and without returns — in Modeling, as well as how to locate handrail posts and rails, where required. In the second part of the series, users will learn how to utilize toe plate, grab bar, and handrail connections. Part 1 will be held April 7 from 10:30 a.m. to 11:30 a.m. central. To register for the webinar, click here. Part 2 will be held April 28 from 10:30 a.m. to 11:30 a.m. central. To register for the webinar, click here. If you've missed any of our previous webinars, you can access the videos on our YouTube channel or on the webinar archive. Design Data will be showcasing SDS/2 at a number of tradeshows this month. The 43rd annual SEAA National Convention and Tradeshow includes high-quality educational sessions and the chance to network with steel erectors, fabricators, detailers, engineers and more. Coal Prep is the only annual trade show and conference in the U.S. dedicated to coal preparation and processing. Industry professionals come from all over the world to share the latest ideas and most effective techniques on coal preparation and processing plant technologies. Design Data will be exhibiting in booth #1511. The Spring BIMForum, focused on the theme of transforming deliverables, will include presentations on how to better harness the information created with BIM tools and whether traditional formats still work. Design Data will be exhibiting in booth #28. The 2015 NASCC Steel Conference, held March 25-27 in Nashville, Tennessee, was the most popular conference in AISC's history, with more than 4,500 structural engineers, detailers, erectors and fabricators from around the world attending. 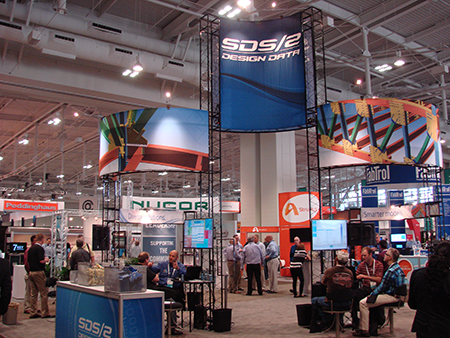 Design Data's SDS/2 booth was dedicated to showcasing the latest advancements in the software. In-booth demonstrations focused on SDS/2 2015 and included custom components, detailing templates, new connection design functionality and SDS/2 Erector. In addition to the main SDS/2 booth, Design Data also hosted the BIM Easy Lounge in an adjoining booth. With couches, peanuts and rustic touches throughout, the area allowed attendees to kick back, relax and learn more about the BIM process and the upcoming Keys to Making BIM Easy Seminars through a video presentation. More than 1,000 attendees joined Peddinghaus at its annual customer appreciation event. Among the highlights: dancers, singers, country music impersonators, a performance from the PeddiBand, and a set by Larry the Cable Guy. To view additional photos from the 2015 NASCC conference, click here. Be sure to join Design Data at the 2016 NASCC Conference, which will be held April 13-15 in Orlando, Florida. Design Data will present during AISC's series of BIMsteel workshops that will be taking place across the country in the upcoming months. The two-part workshop kicks off with a 30-minute introduction focusing on making the most of the model, before proceeding to Part 1: Model Sharing - From Design to Detailing. Related topics include efficiently packaging and preparing the model for transfer, and properly receiving and importing the model for best results. Part 2: Model Review and Approval includes packaging the model to be used as a submittal for the review process, receiving and working within a model for review and approval purposes, and a Q&A and panel discussion. The next workshop takes place April 23 at the Hyatt Regency Birmingham in Birmingham, Alabama. To register or learn more, click here.